A regular breeding resident and migrant; occasionally observed in early winter months, primarily in southern Minnesota, and may even overwinter where open water is available. The Northern Pintail was a rare species during the Minnesota Breeding Bird Atlas (MNBBA). Circumpolar in distribution, the Northern Pintail’s breeding range in North America stretches from Alaska across Canada to Newfoundland and Nova Scotia and south through the northwestern and north-central states. The core of the species’ breeding range is in the Prairie Parklands of central Canada and the Prairie Potholes of the northern Great Plains (Figure 1). Small pockets of abundance also occur in Alaska. A game species, the Northern Pintail is designated a High Continental Priority by the North American Waterfowl Management Plan; it was also designated a Common Bird in Steep Decline in 2014 by the North American Bird Conservation Initiative and assigned a Continental Concern Score of 12/20 by Partners in Flight. The Minnesota Department of Natural Resources has listed it as a Species in Greatest Conservation Need. Ranges from a year-round resident in some areas of its breeding range to a long-distance migrant in other areas. Birds breeding in the Prairie Pothole Region are medium-distance migrants, wintering largely along the Gulf Coast of the United States. A dabbling duck that feeds on grain, aquatic plants, and invertebrates. Breeding distribution and relative abundance of the Northern Pintail in North America based on the federal Breeding Bird Survey from 2011 to 2015 (Sauer et al. 2017). Like so many other waterfowl species, the Northern Pintail likely reached its peak abundance at least 150 years ago, prior to drainage of the majority of Minnesota’s wetlands and the unregulated commercial hunting of waterfowl that finally came to an end with passage of the Migratory Bird Treaty Act in 1918. By the early 1930s, Roberts (1932) wrote that the pintail still nested in “considerable numbers” in southern and western Minnesota and occasionally in forested areas but it was “by no means, as abundant a summer resident as formerly.” Prior to 1898, for example, it was quite common at Heron Lake in Jackson County and abundant at Mud Lake in Marshall County. At the time of his writing, Roberts had confirmed nesting records (nests with eggs) from just 3 counties: Jackson, Lincoln, and Marshall. Females with young broods were reported in Big Stone and Otter Tail Counties. Many birds were also reported in Grant County, and nests (no mention of eggs) were reported from Polk County. The Northern Pintail has never fully recovered in Minnesota to its former levels of abundance. Thirty years after Roberts wrote the first comprehensive account of the species’ status, the Northern Pintail comprised less than 5% of Minnesota’s breeding duck population (Lee et al. 1964). To date, the species remains a relatively rare breeding resident. Green and Janssen (1975) described it as a breeding resident “primarily in the western and southern prairie regions” but also noted 4 breeding records east of the species’ primary breeding range in Aitkin, Beltrami, Cass, and Washington Counties. Several years later, Janssen (1987) delineated those counties where breeding had been confirmed since the year 1970; 14 of the 15 counties were within the species’ primary breeding range and only 1, in Aitkin County, was in the northern forest region. The species was not, Janssen wrote, a common breeder in the state. Several years later, Hertzel and Janssen (1998) would add 4 counties to the list; only 1 (Lake of the Woods) was outside of the Northern Pintail’s primary range in central and western Minnesota. When the Minnesota Biological Survey was working in the Prairie Parkland and Tallgrass Aspen Parklands Provinces, it reported only 32 breeding season locations for the species. Nearly one-third of the records were reported in 2 counties: Marshall and Lac qui Parle. The remaining records were within the species’ primary breeding range (Minnesota Department of Natural Resources 2016). MNBBA participants reported 55 Northern Pintails records in 1.0% (45/4,734) of the surveyed atlas blocks and in 1.0% (23/2,337) of the priority blocks. Breeding evidence was documented in only 7 (0.1%) of the surveyed blocks (Figures 2 and 3; Table 1). The species was observed in 25 of Minnesota’s 87 counties (Chippewa County was included because of a block that straddled both Chippewa and Lac qui Parle) and documented breeding in 7 counties; 4 of the 7 were in west-central Minnesota. Breeding evidence (fledged young) was documented in Swift County for the first time during the atlas. Although the Northern Pintail remains a regular, albeit rare, breeding resident in western and central Minnesota, there are occasional summer reports further to the east (Minnesota Ornithologists’ Union 2016). During the atlas, observations were reported in several north-central and northeastern counties, specifically Aitkin, Beltrami, Cass, Lake, and St. Louis. Indeed, in 2015, 2 years after the atlas was completed, Steve Wilson documented a nesting pintail (a female with five young observed July 26) on an old tailings basin in central St. Louis County; it was the first confirmed nesting record for the county (Minnesota Ornithologists’ Union 2016). Overall, the Northern Pintail’s distribution across Minnesota remains similar to its distribution at the time of Roberts’s writing, but its abundance is likely magnitudes smaller. During wet or normal moisture conditions, pintails are common in the pothole regions east of the Missouri River and uncommon west of the River. During dry conditions, more pintails breed west of the River, or birds may fly past South Dakota and breed elsewhere (Drilling et al. 2016). Breeding distribution of the Northern Pintail in Minnesota based on the Breeding Bird Atlas (2009 – 2013). Summary statistics of observations by breeding status category for the Northern Pintail in Minnesota based on all blocks (each 5 km x 5 km) surveyed during the Breeding Bird Atlas (2009-2013). Summary statistics for the Northern Pintail observations by breeding status category for all blocks and priority blocks (each 5 km x 5 km) surveyed during the Minnesota Breeding Bird Atlas (2009-2013). The Northern Pintail relies on ephemeral and semipermanent wetlands that support emergent aquatic vegetation and are embedded in a landscape with short and sparse upland cover (Figure 4). Permanent wetland basins are rarely used (Clark et al. 2014). The species has a strong tendency to nest farther away from water (often 1 to 2 km) (Duncan 1987) and in more open cover than any other duck (Baldassarre 2014). Several studies have documented that the Northern Pintail demonstrates a higher preference for nesting in croplands and grain stubble than any other dabbling duck, with estimates of 34%–57% of the nests located in cultivated fields (Klett et al. 1988; Reynolds et al. 2001). These same studies document that nesting success in these fields is dismally low at 0%–7%. Because the Northern Pintail is an early nesting species, many of the nests placed in cultivated fields are destroyed by agricultural activities as the season unfolds. Other frequently chosen nesting habitats in the Prairie Pothole Region include hayfields, pastures, and grasslands, including recently burned sites, where nesting success is generally higher although quite variable (10% to 27%) (Clark et al. 2014). Similar to other waterfowl that depend on seasonal wetlands during the breeding season, the Northern Pintail is sensitive to local drought conditions and will readily move further north to seek more suitable wetland conditions (Baldassarre 2014). Typical breeding habitat of the Northern Pintail (© Lee A. Pfannmuller). As for all waterfowl, population numbers have been closely monitored since 1955 by the Waterfowl Breeding and Habitat Survey, a coordinated effort of the U.S. Fish and Wildlife Service and the Canadian Wildlife Service. The survey is conducted in 2 large areas: the Prairie Pothole Region of the United States and Canada (known as the Traditional Survey Area) and the eastern Canadian provinces and the state of Maine (known as the Eastern Survey Area). Although Minnesota is not included in either area, the Traditional Survey Area covers the core of the Northern Pintail’s breeding range and is used as the foundation for monitoring trends in population numbers. In 2015, the survey estimated a continental breeding population of approximately 3.0 million Northern Pintails (Figure 5) (Zimpfer et al. 2015). 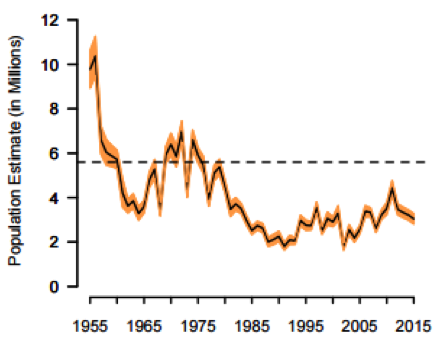 This is down approximately 6% from 2014 and 24% from the long-term average of 4.0 million birds (1955-2014). Although the population has shown a small increase in recent years, it is still well below the continental goal of 5.6 million birds established by the North American Waterfowl Management Plan (2004). The decline was due to conversion of grasslands to croplands, loss of ephemeral wetlands, and widespread drought conditions in the Great Plains in the early 1960s and from the late 1980s through the early 1990s. Recovery since then has been very slow, despite focused efforts to improve habitats in the Prairie Pothole Region and more favorable precipitation conditions beginning in the mid-1990s. In Minnesota, where the loss of temporary wetlands has been significant, the Northern Pintail also has experienced a dramatic decline. The Minnesota Waterfowl Breeding Population survey is focused on the central and western regions of the state and has been tracking populations since 1968. In 2015 the survey documented 396 birds, which was above the 10-year average (2006–2015) of 276 birds but down from the previous 10-year average (1996–2005) of 767 birds (Figure 6). The loss of more than 90% of Minnesota’s wetlands and the weak protection currently afforded many temporary and seasonal wetlands are considered largely responsible for the decline (Minnesota Department of Natural Resources 2006). The federal Breeding Bird Survey also documents a declining population trend in Minnesota, but population numbers are so low that the statistical modeling is not robust and yields an estimate with low credibility (Sauer et al. 2017). Although it would be easy to ascribe the Northern Pintail’s dramatic population decline to the loss of wetlands, field studies point to the fact that as wetland conditions began to improve, other dabbling duck populations rebounded significantly, often exceeding the population goals established by the North American Waterfowl Management Plan. Northern Pintail populations, however, increased only slightly (Miller et al. 2001). Poor nesting success is believed to be the principle culprit, attributed to high predation rates and a change in agricultural practices that resulted in the destruction of nests (Miller et al. 2001). The problems are considered most acute in the Canadian Prairie Provinces, where nearly 75% of the prairie grasslands were converted to croplands during the 1900s (Trottier 1992). Habitat loss is compounded because farmers no longer regularly allow their fields to go fallow between harvest years but are instead planting crops every year (Carlyle 1997). Population estimates for the Northern Pintail in the Traditional Survey Area, 1955–2015 (Zimpler et al. 2015; dashed line is the NAWMP population goal). 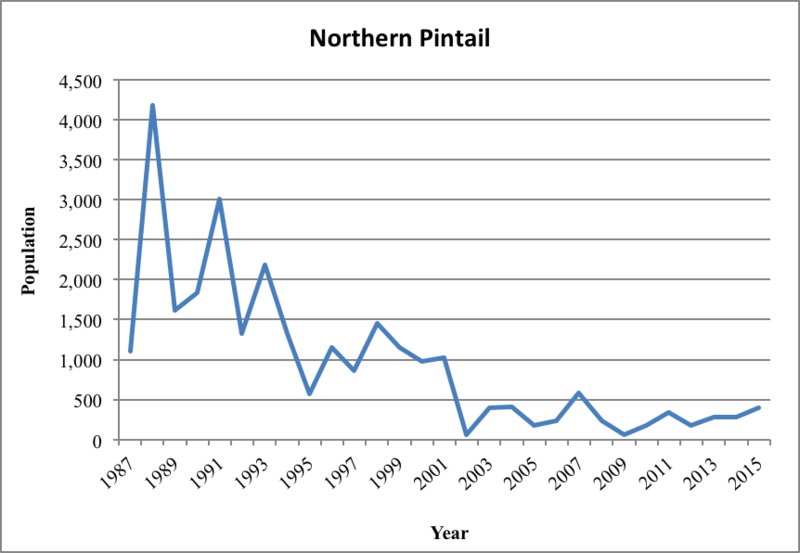 Northern Pintail numbers reported during the Minnesota Waterfowl Breeding Population Survey, 1987–2015 (data not corrected for visibility; taken from data presented in Cordts 2015). Because of its significant decline, the Northern Pintail is considered a species of High Continental Priority by the North American Waterfowl Management Plan (2004) and is a focal species for the Prairie Pothole Joint Venture (Ringelman et al. 2005). It also was recognized as a Common Bird in Steep Decline in 2014 by the North American Bird Conservation Initiative (2014). Partners in Flight (2017) assigned it a moderately high Continental Concern Score of 12/20. It is considered a Species in Greatest Conservation Need by the Minnesota Department of Natural Resources (2015). The Northern Pintail continues to be a harvested game species throughout its North American range. In 2015 approximately 447,000 birds were harvested in the United States, 55% of which were harvested in the Pacific Flyway. The Mississippi Flyway constituted approximately 21% of the total harvest; only 9% (8,240 birds) of the flyway’s harvest occurred in Minnesota (Raftovich et al. 2016). The Northern Pintail is one of the rarest dabbling duck species in Minnesota, comprising less than 1% of the estimated population of all dabbling ducks (Cordts 2015). The Mallard, the Blue-winged Teal, and the Wood Duck comprise the overwhelming majority of dabblers in Minnesota (96%). As a result, much of the conservation work is focused on these three species. Regardless, all conservation directed at improving the status of Minnesota’s wetlands and grasslands also benefits the Northern Pintail. In particular, the Minnesota Department of Natural Resources’ Long Range Duck Recovery Plan (Minnesota Department of Natural Resources 2006) and the Minnesota Prairie Conservation Plan, initiated by a consortium of conservation groups (Minnesota Prairie Plan Working Group 2011), both establish ambitious goals for protecting and restoring critical wetlands and grasslands throughout western and southern Minnesota. These efforts are particularly crucial in light of the region’s vulnerability to warming temperatures and the projected loss of nearly two-thirds of the wetlands in the Prairie Potholes (North American Bird Conservation Initiative 2010; Minnesota Interagency Climate Adaptation Team 2013). An initial assessment of the species’ vulnerability to climate change ranked it as low (North American Bird Conservation Initiative 2010). Yet the Northern Pintail’s reliance on temporary and semi-permanent wetlands makes it especially sensitive to wetland loss. Drought conditions on the prairie often force birds much further north to breeding grounds in northern Alaska (Baldassarre 2014). If the Northern Pintail is to remain part of Minnesota’s waterfowl legacy, habitat conservation efforts informed by the projected impacts of climate change are critical. Carlyle, William J. 1997. “The Decline of Summerfallow on the Canadian Prairies.” Canadian Geographer 41: 267–280. Klett, Albert T., Terry L. Shaffer, and Douglass H. Johnson. 1988. “Duck Nest Success in the Prairie Pothole Region.” Journal of Wildlife Management 52: 431–440. Minnesota Department of Natural Resources. 2006. Long Range Duck Recovery Plan. Minnesota Interagency Climate Adaptation Team. 2013. Adapting to Climate Change in Minnesota. Reynolds, Ronald E., Terry L. Shaffer, Randy W. Renner, Wesley E. Newton, and Bruce D. J. Batt. 2001. “Impact of the Conservation Reserve Program on Duck Recruitment in the U.S. Prairie Pothole Region.” Journal of Wildlife Management 65: 765–780. Trottier, Garry C. 1992. Conservation of Canadian Prairie Grasslands: A Landowner’s Guide. Ottawa: Canadian Wildlife Service.